When I was in Massachusetts last month, I gained roughly six pounds in 3 weeks. There is just something about going home--- I crave the flavors and food rituals of my childhood. There is no home like the taste of home. Right? Sadly for my waistline, one of those tasty rituals is Friendly's. Every kid in New England grew up with Friendly's. It's the Dairy Queen of the North, if you will. 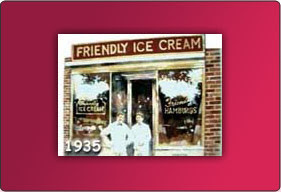 Started in 1935, it was founded not far from my home town and is a staple of small town New England life. It was also where I worked as a "soda jerk" (making ice cream and drinks) for a year when I was in high school. Friendly's is a definite ritual from my childhood and contributed mightily to the expansion of my vacation waist line. While in MA, we were heading to Friendly's after dinner 3-4 nights a week for something along the lines of a hot fudge sundae with their famous Buttercrunch ice cream. Looks like this is about to change and my griping will come to an end. Window peeking on 19th Street yesterday, I noticed a friendly, colorful sign where Dessert Shoppe used to be. It's for... wait for it... wait for it... a frozen yogurt shop! Giddly with excitement, I pulled in to the parking lot to see if I could get some scoop. Looks like the Heights will be the newest addition to a chain of frozen yogurt shops called "Menchie's." I know. Chain. Eh. Still, I'd rather spend my fro-yo allowance at a shop in the Heights, which may employ some Heights area high schoolers (they're hiring now), than at a fro-yo chain in River Oaks. And I can save gas and work the treat off by walking! One of the reasons we chose Swirll over places like the BerriPop on Washington is that at Swirll you pick your flavor, administer your own toppings and pay by weight. The smallest mandatory serving at some shops is still too much for my small kids. My older son, while capable of eating a large quantity of dessert, eats so slooooow that we have to give him a very small amount just to avoid being there for 2 hours. From the info on their website, Menchie's is going to work the same way. You pick, mix, top, weigh and pay. Of course, you know I wish this was a local shop but it may actually be locally owned. The franchise owner may be some savvy Heights resident who didn't know a ton about frozen yogurt, but knew the neighborhood was missing it as an option. He or she searched on line, found a franchise that wasn't common around these parts and invested. Are you out there, new Menchie's owner? Tell us more! Ahhh. Back at the keyboard. Feels good! As many of you probably know I was recently awarded the "Best Neighborhood Blog" prize at the inaugural Houston Web Awards from the Houston Press. What an exciting honor! I was back East with the family when I got the announcement and wasn't able to make the party. Bummer. I love a good party. 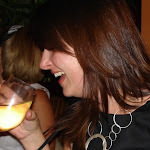 Anyway, many thanks to all of you who read my ramblings here, chat with me on Facebook and tweet around on Twitter. There are times when people around the Heights will ask me "Oh, so did you hear about this?" and my answer is often "Not yet. Tell me about it." See, I am not really here to break stories. I am here to follow up on how the story fits in our lives in the Heights. It would be way to stressful to always have to be the first to know. There have been a couple times, though, where my desire to be well informed so I can be a good resource has put me in the front of the knowledge line. This was the case with Down House. I was lucky enough to be among the first in the area to know some details about the new eatery on Yale. To back track the how and why, read here and then here. Well, I have had the pleasure of brunching at Down House since the doors opened and it's quite good. My meal wasn't without it's "just opened" flaws, but my family enjoyed it. Initially the restaurant was only open for breakfast and lunch, with drinks available in the evening. Well, as of this week, they have gone full on. The restaurant utilizes local farms and vendors who deliver “nothing but the best" Headed by Executive Chef Chandler Rothbard, the kitchen works with folks like Black Hill Ranch, Utility Research Garden, Sabra Ranch, Knopp Branch Farm and others "to create some amazing dishes." Breakfast is available from 7am- 3 pm, Monday through Friday. Evenings bring the small plates menu created to pair with the house cocktails, craft draft beers, and wines. Wondering how Down House gets to have a full bar in the dry part of the Heights? The restaurant holds a private-club liquor license. I think this is a welcome addition to the neighborhood. Be warned: how much you'll enjoy it may depend on your Hipster Tolerance Level. Personally, for good food and a good drink, I can deal. Hope to see you there! 1801 Yale St, 18th @ Yale.